The minister showed interest in our work and congratulated us on our results so far! 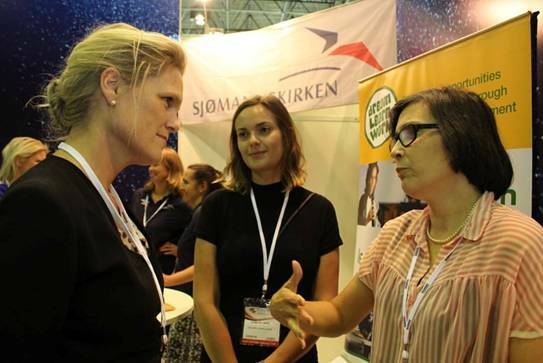 Dream Learn Work’s plan for the near future is to focus on gender equality which Tybring-Gjedde is also engaged about, especially in the Oil and Gas sector. On all of her speeches during this visit she highlighted the importance of gender equality worldwide and specially in Brazil. We feel honoured that she took the time to pass by the stand and took the time to hear about Dream Learn Work. “The current situation is challenging, but despite this, I feel confident about the successful, long-term future for the oil and gas industry. The world still requires enormous amounts of energy. For this industry, challenges can also represent opportunities. I was pleased to see a considerable number of Brazilians in Stavanger during the ONS. This week we have another great opportunity to learn more about world leading competence. Rio Oil and Gas is an ideal place to build partnerships. The Norwegian supply and service industry is in high demand globally and Brazil is one of the largest markets for Norwegian suppliers. What happens in the oil and gas sector in Brazil is not only important for the prosperity of Brazil, but also for families and communities in Norway. Our countries share many of the same challenges in the oil and gas sector, and we both see technology and innovation as a key approach to solve these challenges, and that is why cooperation is of great, mutual benefit. Together we should aim to develop tomorrow’s technology”, she said.